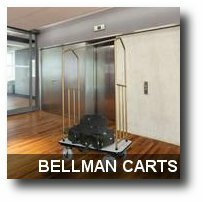 Indoff offers a complete line-up of high-quality Bellman's Carts that are perfect for upscale hotel lobbies to assist with guest check-in. These heavy-duty carts can be maneuvered with ease and can hold up to 1,000 lbs of luggage and hanging garments. Call (844) 433-9610 for shipping charges. This Traveler' Series Chrome Bellman's Cart features chrome uprights that are made from sturdy 18 gauge tubular steel with an 18 gauge stainless steel crossbar for hanging garments. This versatile cart offers great handling and easy elevator access. The 3/4" thick plywood deck comes with a needle-punched, stain-resistant carpet for long wear and reinforced steel under-carriage. Ample 1,000 lbs capacity. 8" Pnuematic Casters are non-marking grey. Carpeting is minimum of 25% recycled material by content. This Traveler' Series Economy Bellman's Cart features chrome uprights that are made from sturdy 18 gauge tubular steel with an 18 gauge stainless steel crossbar for hanging garments. This versatile cart offers great handling and easy elevator access. The 3/4" thick plywood deck comes with a needle-punched, stain-resistant carpet for long wear and reinforced steel under-carriage. Ample 1,000 lbs capacity. 5" Poly Casters are non-marking grey. This Traveler' Series Brasstone Bellman's Cart features brass uprights that are made from sturdy 18 gauge tubular steel with an 18 gauge stainless steel crossbar for hanging garments. This versatile cart offers great handling and easy elevator access. The 3/4" thick plywood deck comes with a needle-punched, stain-resistant carpet for long wear and reinforced steel under-carriage. Ample 1,000 lbs capacity. 8" Pnuematic Casters are non-marking grey. Carpeting is minimum of 25% recycled material by content. This Traveler' Series Stainless Steel Bellman's Cart features stainless steel uprights and crossbar for hanging garments. This versatile cart offers great handling and easy elevator access. The 3/4" thick plywood deck comes with a needle-punched, stain-resistant carpet for long wear and reinforced steel under-carriage. Ample 1,000 lbs capacity. 8" Pnuematic Casters are non-marking grey. Carpeting is minimum of 25% recycled material by content.